Republican Senator Lindsey Graham said, "Any effort to go after Mueller could be the beginning of the end of the Trump presidency." Speculation that Donald Trump will try to fire Special Prosecutor Robert Mueller has heated up. Trump publicly lambasted Attorney General Jeff Sessions over his recusal from the Russia investigation because that has kept Sessions from stopping or interfering with Mueller's investigation… and Trump's right-wing allies have been trying to undermine Mueller by attacking his credibility and baselessly claiming that he has some sort of conflict of interest. We don't know what will happen, but this is certainly ominous "writing on the wall." So, if Trump fires Mueller or interferes with his investigation, we're going to be ready. And we need to know you'll be with us to ramp up the fight for accountability immediately. Thank you for standing up for transparency, accountability, checks and balances, and the rule of law. Trump has crossed so many lines, with his flagrant disregard for the law and his anti-constitutional attacks on vulnerable communities and our democratic institutions, that it’s hard to keep track of them all. But there is one line that he might soon try to cross that we need to be ready to respond to immediately should it happen — with a MASSIVE outpouring of Americans demanding swift accountability and pressure on congressional Republicans even more intense than what they’ve seen on any issue so far. That line would be orchestrating the removal of Special Prosecutor Robert Mueller or doing anything to end his investigation. 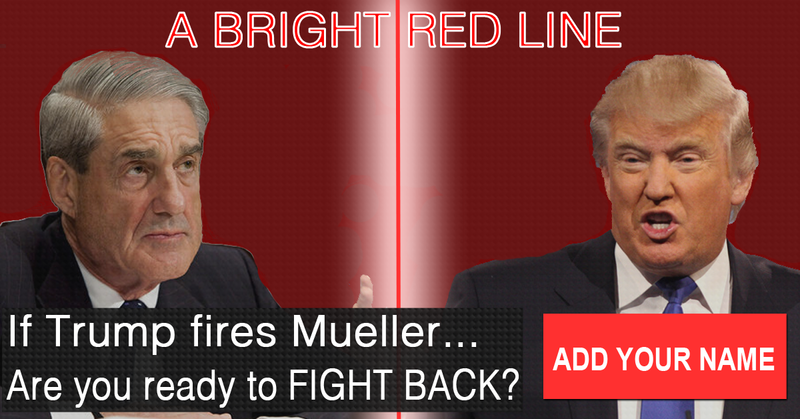 We’re working to protect Mueller's investigation but, should Trump cross this bright red line, we're ready to go all-in … planning a national campaign, along with key allies, to respond right away in the biggest way possible, and that includes getting thousands of Americans at protest events that day. But we need to know that you’re with us, Stick. We’ve already seen much in the way of troubling reports that suggest the possibility of obstruction of justice and corruption at the highest levels of the Trump administration. But the removal of Mueller (and whatever other procedural steps Trump would have to take to have him fired) would be such a glaringly obvious example of obstruction — and such an unambiguous admission of wrongdoing — that it would mark the pivotal moment that Republicans must finally say “enough!” to standing by their president. And several GOP members of Congress have already acknowledged the gravity — and potential consequences — of firing Mueller. You won’t be able to miss our response should Trump fire Mueller and take the current national crisis that is his presidency to a whole new level. Thank you for all of your support and your unyielding dedication to defending the American Way!